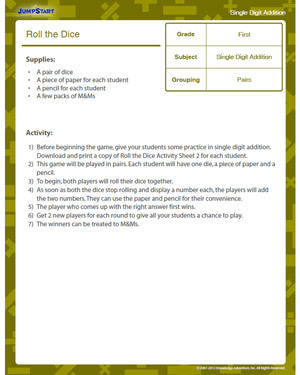 This is one fun lesson plan that you will love to introduce your class to! Ditch all old methods of teaching single digit addition to 1st graders- here’s is an interesting new way of doing that. Divide your class in pairs and let the game begin. After a few rounds of Roll the Dice, single digit addition will be a cakewalk. Soon, kids will master the concept without resorting to the help of pen and paper or even their fingertips.